Impressively breaking his maiden at only his second outing, the well related Paterangi looks set for a bright future after his success at Kyneton on Thursday. A game third after being galloped on when debuting at Ballarat three weeks previously, the son of champion stallion Redoute's Choice was a hot odds-on favourite with Ryan Maloney taking the ride. Always travelling nicely mid-field, Paterangi loomed up his rivals straightening, quickly putting a gap on them to win by a soft 1 1/4 lengths. "He had it won a fair way from home," Greg Hoysted said, "he was always travelling pretty easily." "He has done a good job in only two starts and I think he will keep stepping up. The further he goes the better he will be, his dam was a very good stayer and I can't see why he can't be as well." Maloney reported that Patarangi still has plenty of upside - "he switched off when he hit the front, he thought the job was done. He has nice scope about him, look out for him when he gets up to 2000m." A half-brother to the stakes winner Pravana, Patarangi is a son of Zabeel's three times Group One winning daughter Pravda who ran second in a NZ Oaks. Her full brother Cronus won the Adelaide Cup and this is also the family of the big race winners Samantha Miss, Envoy and Golden Heights. We are looking forward to our good run continuing over the weekend as we saddle up five runners at three different meetings on Saturday. The highlight of which is Alaskan Rose, a worthy competitor in the Gr.1 $1 million Australian Oaks. An eye-catching second in the Adrian Knox Stakes last weekend - recording the fastest final splits in the race - the daughter of Encosta de Lago looks perfectly primed for the Classic distance. "She has come through that run very well and whilst it is a strong Oaks with a lot of depth we could not be happier with our filly. She has a lot of ability and that last run makes it look like she is ready for the 2400m," Michael Moroney said. Nicely drawn in barrier six for Dwayne Dunn, Alaskan Rose is looking to be Encosta de Lago's first Australian Oaks winner. Earlier in the day at Randwick we have Tulsa lining up in the Listed South Pacific Classic and with the blinkers on we are expecting a good run. "He is down in grade off the Randwick Guineas and the rain Sydney has had should help him. We have been very happy with him." Meanwhile at Sandown our first of two runners is the South Australian Derby bound War Legend who needs a bit of luck to gain a run in the fifth event as fourth emergency. "His last run was good," Moroney said of the Rip Van Winkle gelding's Alister Clark Stakes fifth. "He is relaxing now so we are taking the ear muffs off and should he sneak in he will prove hard to beat." Later in the day we have Black Tomahawk second up in the 1600m handicap and it would be no surprise to see him in the finish. "We thought he ran quite well first up considering that he got back in a slowly run affair," said Moroney. "He can settle a bit further forward from a better gate this time and he does have a pretty good second up record (two wins from three attempts)." Debutant Carmel is our other Saturday runner, the daughter of Dane Shadow contesting the second event, a 1000m maiden, at Bendigo. "She is a real two-year-old type," Moroney said. "We had her in Sydney to prepare for the Inglis Classic race but she wasn't quite mature enough. 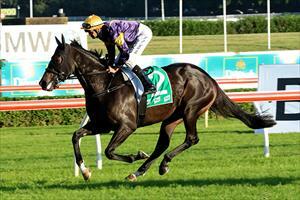 She has trialled up well and she has good speed, she is an interesting runner."